A founding figure in historically-oriented philosophy of science. Viewed science as a struggle against ideological obstacles, and benefiting from reverie and imagination as much as from Reason. Many Americans first discovered Bachelard's work behind the famous "paradigm shifts" described by Thomas S. Kuhn. Bachelard described the products of science and imagination as epistemological structures -- "all is constructed" -- and the shifts from one answer to another as "ruptures". Alexander Koyre interpreted these as "shifts". Gaston Bachelard is currently considered a "single author." If one or more works are by a distinct, homonymous authors, go ahead and split the author. 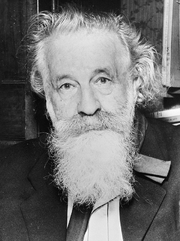 Gaston Bachelard is composed of 14 names. You can examine and separate out names.